It has been a year and I haven't added any updates. I thought about adding updates from time to time, but the intent of this page was to walk you thru the first couple of years of building a website, and I think I've accomplished that. For the past year the website has run on autopilot. I may spend a couple hours a week on it and every once in a while write a new article, or someone else adds a new page. But for the most part I'm letting it remain the same for a while. My son in college has agreed (again) to write some articles about playing baseball in college. Hopefully this year that will happen. A new section for the baseball moms is much needed and in my plans. Also, adding some videos would be helpful. Oh so many plans and only so much time. The character of a website makes many changes over time. Once the foundation is built, then the frills can be added. My first frill was an ebook for T Ball coaches l wrote last spring and it has been a hit. I sold around 100 books during the spring. Abd now I have started another website about a completely different subject, home security. It is off to a great start. As for this site, the traffic keeps growing and the money keeps flowing. I'll probably come back and add some of the above mentioned features after I finish the home security website. This truly has been a work of pleasure. And I know now you can make money online, even after you quit working online. That is the best part. Oh my gosh, the summer flew by. Once our son graduated from high school and starting playing with his summer team, we knew the website was not going to get much attention. The team played eleven straight weekends. And yes, we didn't touch the website for those eleven straight weeks. This was the last summer for the Kansas City Express. Some of the kids and our son had played together for eight or nine years. We decided to travel every weekend with the team and watch as many games as possible. It was certainly well worth the effort. The boys played great, I think their record was something like 48 and 5. Many of the other parents traveled also, so we just had a good old time all summer. But this website went untouched. Completely abandoned. No updates or new pages. Our day jobs and summer baseball kept us quite busy. But guess what, the website kept on working without us and did quite well in the money making category. Those checks we got every month sure came in handy with traveling expenses..
We certainly do not recommend abandoning a website for four months, but the foundation we had laid held everything together. We moved our son to college about two weeks ago. He is four hours away, practicing with his junior college team. So we are back, full of energy and ready to kick this website into high gear. Hope you had a great summer and got to play or watch a lot of baseball, the greatest game on earth. Here's to a great fall season. It is April and baseball teams everywhere are getting into full swing. That must explain the big jump again in our traffic this month. Baseball coaches are looking for some ideas to try at their practices and we are more than happy to offer some suggestions. We appreciate all the coaches who have emailed us their thanks. That really does provide movitation to keep improving the website. And we are open to any suggestions you may have. We are also getting emails from players and parents who are finding our website helpful. We have enjoyed the game of baseball for so long, it feels good to share that love. The school year will be ending soon, and teams will have more time practice, so we are going back to work to provide you with more helpful baseball drills. May is a very active baseball month, so good luck to everyone. As we said in February, we hoped the doubling of visitors every month would continue and it sure did in March. Thank you for finding us and reading our articles. We have tried hard to provide helpful and interesting information on baseball and it helps to see people enjoying our work. A special thank you to tee ball coaches and parents. That was our most popular page in March, so we added another page on the subject. And we are working on a new project for tee ball that we think you will also find helpful. It's a big project, so we are going back to work on it. Check back soon to see the final product. Oh, one last thing. Our website turned a year old in March. It's true that time does fly by when you're having fun. And we sure are having fun "working" on this site. Do you have a passion that you would love to write about? We didn't think we could write anything that anyone would want to read. But if you let your passion and knowledge show thru, it's easy to do. And we make some money doing it. If you would like to learn more, just click here Site Build It. It truly works. What a month February was! Even though February was 2 days shorter than January, we more than doubled our total visitors for the month. And January was double that of Decemebr. This is a trend we really enjoy seeing. Thank you for finding us. There are many baseball sites that have been around a lot longer than we have, and we appreicate you looking down the list and finding us. We have tried to add emotion and passion into our site, and we think that makes us different from the rest. Like adding our son's blog on his senior high school season. That was not added so he could pound his chest, but rather to give you one high school player's point of view. Just something different we try to offer to you, our readers. Thank you again and we sure hope you have a great spring start to this baseball season. We live in the midwest so during the month of January the more serious teams start going to the indoor batting cages. But we forgot that in the warmer parts of the country baseball teams start practicing outdoors. Because of this, we guess, our number of visitors for the month of January were almost double what they were in the month of December. It is so exciting everyday to look at the number of visitors from the day before and see that number just keep growing. If makes you feel like maybe we are doing something people appreciate and enjoy. So "thank you" to you, our readers, for visiting our website and enjoying our stories. We promise to continue to bring you quality information on playing the game of baseball. And thanks to SBI for teaching us how to run a great website. If you are at all interested in starting an online fun business be sure to check out SBI. It is not a get rich quick scam, but with some hard work it can turn into a nice monthly income. Did you happen to notice we twisted our youngest son's arm into writing a blog for us. He is going to write about his senior year of baseball this spring and next fall write a diary on his college baseball life. His first writing attempt is listed under the "College Baseball" title. I must say it is very good. Be sure to check it out. We started our website back in March, so it is not quite a year old yet, but with it being the end of 2011 we decided to take a look back and reflect on what has happened. Building this website has been a challenging, rewarding and fun process. Our biggest surprise has been our youngest son's interest. He hasn't written any artices for us yet, but he gives us helpful comments and lots of suggestions. Coming soon from our son will be his own blog on this website. He hasn't completely committed to this yet, but we are working on him. Our hope is to start it this spring, his senior season of high school baseball and then continue with summer ball and then all thru his college career. We'll see if we can get this to happen. Even though December is the big holiday month and people aren't thinking too much about baseball, our visitors grew again. And many little league teams start working out in January, so we are hoping for another increase. All of us here at Helpful Baseball Driils wish you and yours a Happy and Healthly 2012. November is the start of cold weather in the Midwest. Brian, my 18 year old son, likes to start hitting in the garage about now, ever since we got the garage net. Brian and I made a video of him setting up the net in our garage. We liked it so much we put it on the front page. We are slowly adding new articles every month. And our visitor count slowly is going up every month. We think this is a good sign with baseball being in the off season. We started and are about half done with a new category called “pitching grips”. There are other websites that talk about pitching grips, but we just felt that they do not cover the subject well enough. So we are taking a crack at it. There are so many things we want to add to the website that we sometimes just want to jump out of our skin. But we are trying to put quality before quantity. So it may take a little longer to build our website out, but it will be worth it. In Kansas City the high temperature on Halloween was seventy five degrees. And at the same time much of the east coast had two to six inches of snow. It was a good month to be in the Midwest, sorry New Yorkers. There was steady progress made with the website. You may have noticed that “color” (lots of blue, my favorite color) was added to the website. One day it just dawned on us that our website was pretty black and white. That’s ok, but pretty boring. I know how to add pictures, so we had been doing that all along. But page titles and important words were all black, just like all the other text. I didn’t know how to change this, but I soon found a website, http://www.SBI-website-Builder.com that taught me how. So, I went back and changed all the page titles and other important words. Since our site is fairly new, it didn’t take me too long. I’m sure glad I did it now rather than a year from now. Anyway, I hope you enjoy the new “colorful” website. It sure is fun building this website. The great thing using Site Build It is you are not alone. Any problem you come up with, someone has already been there and fixed that. I can’t recommend SBI enough if you want to make some money from home. New visitors keep finding us everyday. And what is surprising is we expected a big down turn with the baseball season ending, but not yet. So, instead of crossing our fingers and hoping for more visitors, we are going to add some more great articles. Helpful Baseball Drills wishes you and your family A Happy Thanksgiving. September was a great month for my family, more on the filed than with the website. My seventeen year old son’s summer coach put together an aggressive fall schedule and we played at junior colleges all over the Midwest. Our team is all seniors and all the players are hoping to play at the college level. Even with all the baseball traveling we were able to get some things accomplished on the website. With the off season coming up we added a new category for baseball training. Right now there are four pages for this category, with about five or six more to add. Another thing we did that will help down the road is we sought out and obtained some links from other baseball type sites. This is something every website should do to let Google see that your site is liked by others. But the benefit from doing this may not hit the website for a few months. We are in no rush to build our website. Our intent is to add high quality information, and not just a bunch of drills or articles that are not helpful. Building it with a slow steady process is the best way to have a successful website. The tortoise will win this race. Our visitor count reached 2,500 in September, and we had over 5,000 page views. Nothing to get too excited about yet, but we are seeing progress. Hope you are having a great fall. I couldn't stand it anymore, so early in August I stopped the presses and went to work on a new header and new sidebars. With tons of help I got from the Site Build It forums, I made the change in my website's design about mid-August. Web designing is my weakest trait, so I was really worried about wasting my time and not liking my final version. But I really like how my site looks now and probably won't change it again until I can pay someone else to do it. Next, I decided my pages needed more pictures. So I started adding more pictures to every page on my site. I am now down to the last seven pages. Should be done in about a month. Adding pictures really helped how long people looked around my website. In early August, people were spending an average of about 2 minutes looking around, now it is more like 5 minutes. And we now average 60 visits a day, not bad. So, thank you to everyone who has found us, and please spread the word. We have just begun and are adding pages and pictures daily. Our website is now up to 36 pages, and we had 1,100 visitors during the month. Pages views, which tell us how many different pages people looked at, was 2,500. We are happy with our progress and with the fact that people are looking around the website once they find us. July is a busy month with most world series being played. Our son's team played in the Midwest National Championships in Indianapolis. That was a hot week at the ball park. This was the 4th year we have gone to Indy. Pastime Tournaments always puts on a good tournament there and Indy has lots of sights to see. August is a month of rest for many baseball players. So hopefully we can work a little more on our website before fall ball starts. That's one of the great things about starting a website, there is no time frame we have to follow. We work at our own pace. School starts soon so I hope you have a great fall. During the month of June I added 10 more pages of content. That is the number of pages I added in May. It looks like during the baseball season that is about how many pages I will get written each month. I was hoping to write more, but I want them to be high quality so 10 pages will work. Our high school son made the Team Missouri roster and we all spent a week in McAlister, OK. 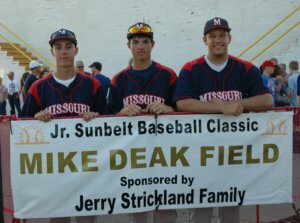 Team Missouri played in the Jr. Sunbelt Classic Baseball Tournament. Nine states and Canada send a team of high school seniors every summer to McAlister to play a 10 game tournament. Each team plays two games a day, except Sunday. It was alot of fun and there were many college coaches at the games. However, I took the week off from writing for this site, but it was worth it. June had 876 visitors and one day the website had 165 page views. Nothing close to big websites, but it was the first time we went over 100. Page views are important because it tells you if people are interested and are looking around on your website. I'm just about done with team drills and next I will add in baseball drills by ages. I have promised that on the website, and now I need to come thru. Links from other websites is something I also need to start thinking about. That will help build more traffic. Solo Build It has a great program for link exchanges and our site is just about getting big enough to join. If you or your son is playing baseball, good luck and enjoy this great time in their life. May was a good month for our website, even though I missed a complete week due to illness. There are now 18 pages on the website, which means 10 were added during May. We had hoped to add a few more than 10 pages in May, but we also worked quite a bit on a new website design. That is a big learning curve, but I think we have turned the corner on that. The company that we joined for $30 a month that has led to this great opportunity is a tight knit group. I recently learned that Solo Build It members in my hometown of Kansas City get together every other month. There is a meeting in late June that I plan to attend. I’m hoping to get some website design advise from these pros. During the month of May we also added a right column and some great pictures. We need to add more pictures, but we are still concentrating on writing new pages of information. Traffic was up in May. We had 291 new visitors and 458 returning visitors to the website. We are especially happy with the number of returning visitors. Hopefully it is because people are finding some value out of our website. In June we are hoping to add 15 more pages, and continue working on the new design for the website. We have just about completed the section on pitching drills and will move to team drills. I think that is the section most people are looking for and I’ve got some great ideas. Even though there is a lot of work and time involved, we are having a great time working together. And we feel like we are really accomplishing something good. In late March I had narrowed down my choices for the theme of my new website to three. I liked all three choices, so I decided to let the numbers do the talking. By that I mean Solo Build It has a program that will tell you the demand and supply for topics (they call them keywords). This program will also tell you the profit potential of keywords. After plugging in all three choices, baseball came out on top. So, as you already know, baseball drills is my website theme. I played baseball growing up and all three of my sons have or are playing baseball. One son played in college, and the youngest son has colleges and pro scouts talking to him. Our one daughter has been around baseball so much she married a minor league baseball player. So baseball works for me. I have coached many teams and hundreds of kids, so I have a pretty good idea which drills work, and which don’t. And I have a lot of other great ideas for the site. I was hoping to get 10 or 12 pages of information up by the end of April, but I only managed to get 8. In the month of April the site had 134 visitors, and 708 page views. I only mention that because no other site I have ever had got those kinds of numbers. I’m putting up one category at a time. The first, batting drills, is almost complete. The next will be pitching. And then team drills and so on. Also, drills for different age groups will be coming on board. If there is something you want to see sooner than later, just let me know. And if you a have a question,suggestion or just a omment, click on the "Contact Us" button and drop me a line. In the month of May I hope to add 10 more good pages of information (drills). I might not reach that number because I don’t like my site design, and I want to build a new one. I purchased a template that makes awesome sites. I just need to learn the finer points of using it. Adding valuable content is the most important thing you can do to your website. However, I sure want a better looking website soon. Check back soon and see if I “got her done”. Starting in 2009 the construction industry took a nose dive. I am a controller for a Midwestern contractor, and by early 2010 our work load was cut in half. So I happened to have a little extra time on my hands. Boy, I hope no one from work is reading this, ha. In March of 2010 I started researching how to make money on the internet. There are lots of people that sure want to tell you, or should I say sell you, on how to do it. And I stumbled around from one “internet guru” to the next for twelve months. After while you are able to identify the so called “gurus” who do want to help you from those that are only after your money. The problem is the helpful ones have been taught by the shark gurus, so they also operate on the shady side. The majority of individuals trying to make money on line are taught to put together a small website overnight. Then you begin the process of trying to fool Google into believing your website is the best. You are taught to spin an article into hundreds of articles. You see, there are expensive “tools” that will do that for you. And there are expensive “tools” that will create back links (votes) for your website. I was buried in the middle of all this in March 2011. One year had passed since I had begun my journey and I had spent $1,800 and had made $50. My wife was not happy with me. It just so happened in March 2011 that one of the gurus I was following published an article about a lady and her husband who had spent six months building their website.I was shocked. Six months building a website, I had to see this site. It is one the best websites I have ever seen. The theme of the website is front porches. They have picture after picture of beautiful front porches. And the site is loaded with information about front porches. If you are looking for any kind of information about front porches, this site has you covered. I would give you a link to the site, but I'm afraid you wouldn't come back, ha. When you are done reading this site, just google "front porch ideas and more",they will be the top listing. And here is the real kicker, this website makes enough money for both of them to quit their jobs. Let me say that again. They live off of this website. I started thinking about my ugly little websites that don’t make a dime. They provide no service to anyone, so why would I think they would make some money? Because the so called “gurus” told me they would. And I had no one else to turn to. Wrong! After looking around on this front porch website I found a section where the couple tells their story. It just so happens they came across a company called Solo Build It. It is a company that really teaches you how to build a wonderful website. You are led by the hand, if you want to be, through the whole process. The information they offer you is outstanding. So obviously I checked them out and finally,after a whole year of bouncing from one idea to another, I had come across someone who gets it right. If I had found this company a year ago I would already have my website completed and probably starting a second one. You see, SBI understands that to make money, you need to give quality service. You need to build a website that will help people and then they will spend time on your website. And they will return when they need more information. You build a trust with your visitors. And then they will buy your recommendations. On March 4,, 2011 I joined Solo Build It. I did not know what my website was going to be about, but I was ready to make a site I was proud of. My boys have laughed at all my previous sites. It got to where I didn’t even tell them about new ones. This time is going to be different. SBI has a great process to help you determine what the theme of your website should be. I’m going through those steps right now. They also have the best forums you will ever find. When people find a good thing, they don’t mind helping others go through the process. Soon I will make my decision and then I will start building an online business.